We had a quiet night at Tyrley, and Meg managed to stay dry this morning! Off at just after 10:00 this morning, straight into Woodseaves Cutting. This stretches for about a mile, and is very narrow in places. The almost sheer sides suffer from regular rock and earth slides. The depth of the cutting can be seen by the height of the bridges. The cutting is through solid rock in places. 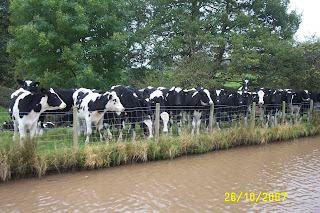 Out of the cutting back into open grazing country, we soon reached Knighton, once home of the Cadbury chocolate factory. They used to produce chocolate crumb here using local milk, which was then shipped, by canal, to Bournville for final processing. The factory is still here, producing milk products, and the wharf still survives. Out onto the massive Shebdon Embankment, where BW are fighting an almost continuous battle to prevent leaks. Piling is currently in progress on the offside. We stopped for the night a little further on, at Bridge 42. Another fine dry day with sunny spells. This weather can’t last, surely. We’re only a stone’s throw from another deep cutting, Grub Street. The spooky atmosphere when I took Meg for a walk at dusk is appropriate for All Hallows Eve! Meg decided to take a bath halfway up the locks on her morning walk today. She’d knocked her ball in to the water and was stretching to get it when she slid gracefully down the bank and launched herself. And I still had to get the ball after hauling her out! It doesn’t dampen her spirits, though. 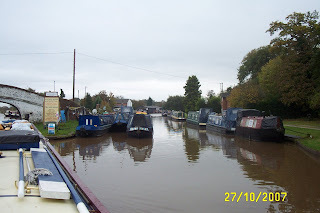 So we got off a little later today, not that it mattered, we’d only intended to go to Market Drayton. An easy run up the 5 locks at Adderley, then another hour or so to the town. We moored and I toddled off to Homebase for some materials for a little project I’ve got planned. Then on to the moorings just on the south edge of town. The Challenger Syndicate base in the centre of the town. I wondered where they all came from…. My favourite name for today. 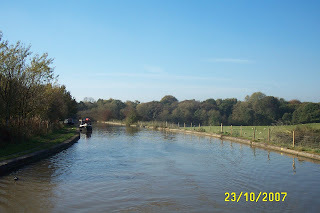 We decided not to stay so close to the town, and pushed on, intending to moor at the bottom of Tyrley Locks. Those who know the area will laugh at this; the locks rise from a narrow cutting with no place to moor. So we had to go up through the locks. It only took 50 minutes, and we were out at the top by 16:00. Moored on the wharf. There’s a sanitary station and water point here, but the drinking water is turned off due to a purification problem. 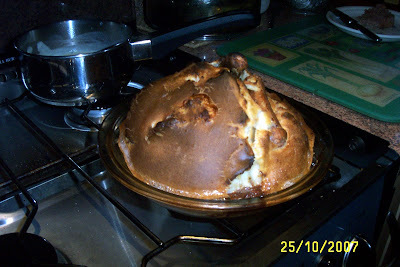 So we’ll have to last until Norbury. Yesterday morning was wet, continuing the rain we had overnight. But by lunchtime the weather had improved considerably. 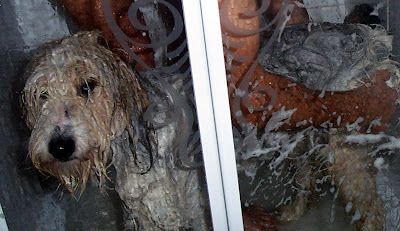 Meg was overdue a shower, so we took advantage of the mild afternoon and subjected her to her least favourite occupation. She’s pretty resigned now, after a bit of token resistance. She smells a bit better, but the main reason was to get the dust out of her coat from the summer. I'm sure she's more comfortable now. Woke up to a bright sunny morning today. 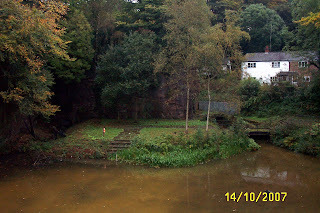 We were looking forward to the 15 locks at Audlem, so were away at 09:40. We crossed the infant River Weaver just before the locks. It’s a lot smaller down here! 40 minutes to the bottom lock, and no queue waiting to go up. 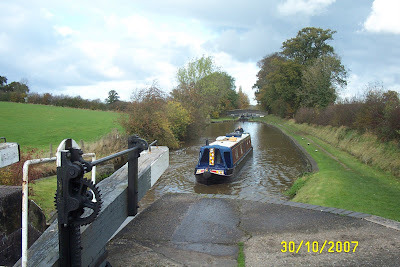 The first 3 were in our favour, but we came up behind a hire boat which had stopped over below Lock 12. 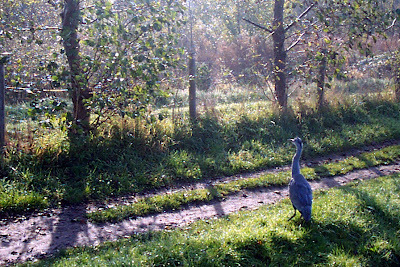 They slowed us down a bit, but we passed them when they stopped for breakfast around Lock 9. From this point on we saw no other boats in the flight, but all the locks were in our favour so we made good time, leaving the top lock at about 13:15. A mile further on saw us almost at the bottom of the next flight at Adderley, and it is here we stopped for the night. It’s been a fine dry day, with threatening clouds around late morning which didn’t amount to anything. The sky has cleared now, leaving a beautiful clear evening. Likely to be cold, though. We decided to move today after all. 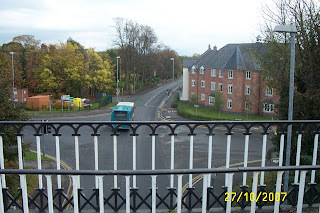 Plan A was to move to Nantwich, find somewhere to moor for a couple of days, and do some shopping. Plan B, in the event we couldn’t moor where we fancied, was to do the shopping, then carry on down to the SUCC moorings at Coole Pilate. As it turned out, we opted for Plan B. Before we left I took Meg for a walk up the 4 Hurleston Locks, then around the reservoir. The birds seem to eat freshwater mussels from the water, judging by the number of empty shells around. 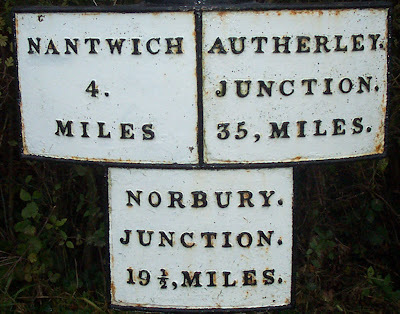 ¾ hour took us to Nantwich. 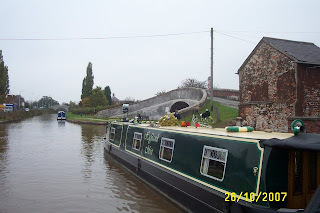 A quick stop at the service point and then moored just above the aqueduct carrying the canal over the Chester Road. Decided at this time to press on, so we made a visit to the town, attractive with a lot of half-timbered houses and shops, then carried on south. 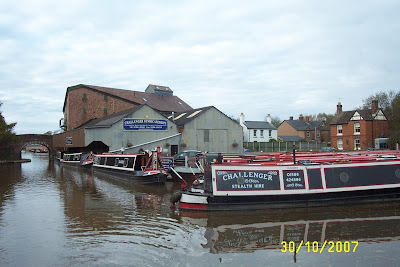 Nantwich Basin is the southern terminus of what was the Chester Canal, running from here to – you’ve guessed it- Chester. 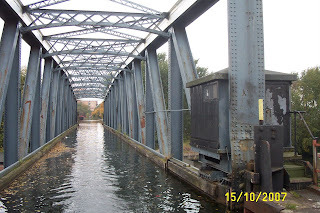 When the Birmingham and Liverpool Junction was completed in 1835 it joined the older navigation, and the 2 were later incorporated as the Shropshire Union Canal. Passing some dredging operations (stopped for the weekend) we arrived at the pleasantly situated pair of locks at Hack Green. 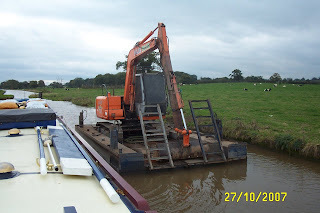 Contractors seem to prefer the versatility of a digger on a raft, rather than a purpose-built dredger. I wonder how many they lose. Not far from here is one of the bunkers built to be a seat of regional government in the event of nuclear war. It’s open to the public but unlikely to be dog-friendly, so we’ll not be visiting. Arrived at the superb moorings at Coole Pilate just before it started to rain. These were set up by the Shropshire Union Canal Society and have picnic tables, BBQ stands and mown grass. I was surprised to see only one other boat there. We’ll stay here tomorrow, the wet and windy weather is forecast to persist until the afternoon. Another grey day today, but still remaining dry. I think this is set to change this weekend. Got away at our usual time of 10:00, and once again a lot of boats heading in the opposite direction. 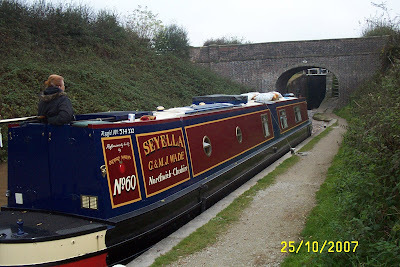 Minshull Lock was reached at around 12:30, and then Cholmondeston Lock, next to the large Venetian Marine, after another 35 minutes. Saw these unusual gongoozlers on the way…. With some more friends the other side of the bridge. 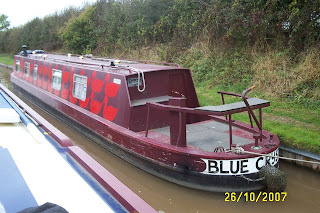 Just past the last lock Mags spotted this maroon boat with red duck decoration and the odd name of BLUE CRYSTAL. Must be some reason for it. Onward to Barbridge junction, creeping out into the flow of traffic and turning left towards Birmingham. 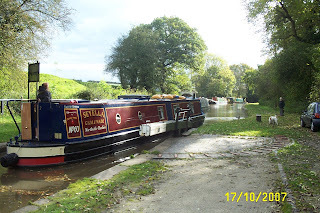 Just past Hurleston Junction and the Llangollen Canal we pulled over for the night. Not sure what we’re doing tomorrow. May stay here for the weekend, or move down to Hack Green. 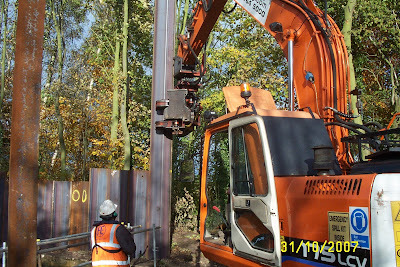 At Minshull Lock we met a couple who do some subcontract work for BW. 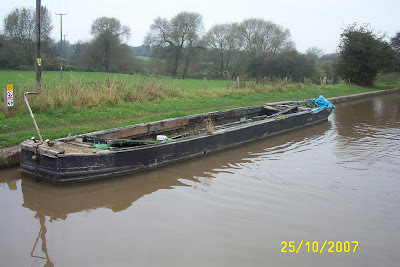 They’d bought a couple of dumb barges at the last BW equipment auction, and were taking them back to Birmingham. Today has been grey and cloudy, but still dry, and quite mild. 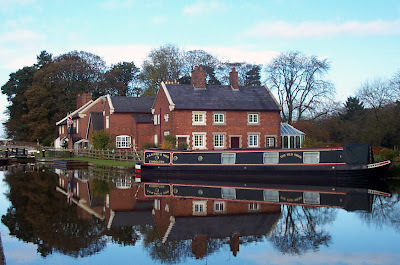 We set off towards Middlewich at around 10:00, and had a pleasant run to the town. The wreck near Croxteth “Just gets worse and worse”. 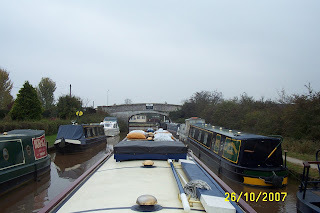 Boat traffic increased as we neared the town, making going up the locks easy with boats coming the other way. 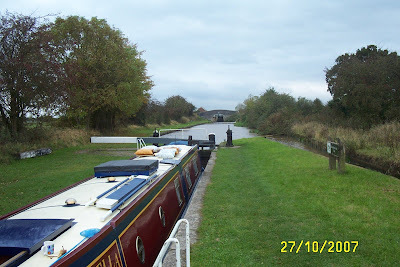 We turned onto the Middlewich Branch, the first few yards of which is the Wardle Canal, arguably the shortest in the country. 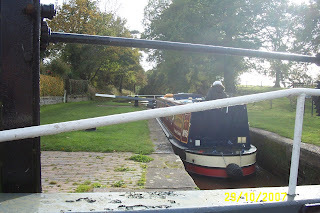 Up Wardle lock, and moored so I could make a visit to Kings Lock Chandlery, then made the decision not to stop on the moorings in the town, so pressed on, up through Stanthorne Lock and moored for the night shortly after. 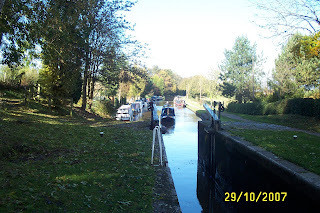 Both the locks we passed on the Branch had queues of several boats waiting to come down, most of which were hire craft returning to base. 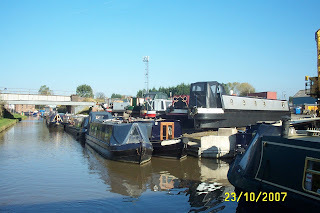 Quite a mixture; Black Prince, Anderson and Middlewich boats, Anderton Marina, Anglo Welsh, Wrenbury Mill and Claymore from Preston Brook. No Viking Afloat, though. 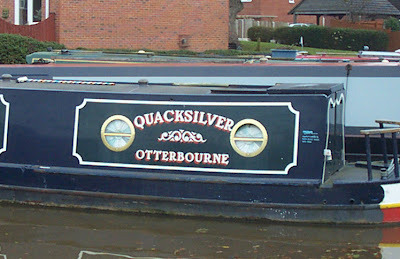 No doubt we’ll see some of those on the Shroppie. A short day today. A hard frost overnight led to a bright sunny morning. We moved the short distance to the marina, arriving at 09:50. We were directed to moor stern in on one of the fitting–out bays, just as the Tesco delivery arrived. So we quickly dumped the groceries in the car park, then I brought the boat into the marina and reversed into position. Ernie the fitter got started on the service, while I ferried the shopping to Mags at the side hatch. While there we got a replacement gas cylinder and 4 more bags of fuel, so left the marina with the boat heavier, but the wallet quite a bit lighter! The new manager, Gary, seems a pleasant enough chap. He’s only been there a few weeks, so I’ll look for changes when we pass this way again next year. 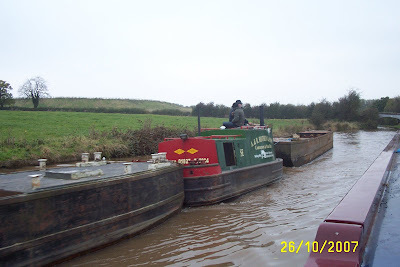 We got away about 13:00, and were moored at Billinge Green Flash a short while later. Pretty busy with boats, half-term holidays to blame, I guess. 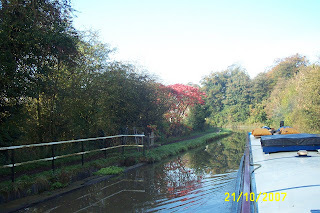 We stayed at the mooring on the edge of Marbury Wood for a few days. 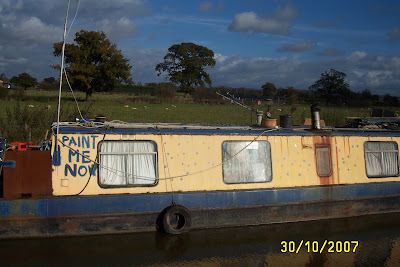 The fine dry weather gave me a chance to touch up a few “bruises” on the hull, incurred on the last bits of the L&L. Misty mornings and fine days. It also gave me and Meg an excuse for some splendid long walks through the woods, and in the Anderton Nature Reserve. Meg is in her element here. Lots of dogs to play with, and squirrels to chase, when we’re not playing ball. I walked in to the edge of Northwich for a bit of shopping on Friday. Dot, John and Paul were arriving at the Anderton lift on Sunday to see us, and we needed provisions. Left around 10 on Sunday morning, made a quick stop at the services and arrived at the 24 hour moorings near the lift around 11. Got the dinner started, then I took the hairy one up in the reserve to have a look around. 20 minutes later our visitors arrived, and we had a pleasant afternoon, eating and chatting. They’d bought our latest lot of mail with them too. Beautiful weather, warm and sunny. They left about 3, so I put the aerial up, took Meg out for her constitutional, and then settled down to watch Lewis Hamilton lose the F1 world championship in Brazil. It must have been desperately disappointing to be let down by the car that’s been so reliable all season. Still, Raikonnen had put in the work to be a deserved winner. I’m glad Alonso didn’t get it though, after all the snide comments there have been this year. We moved back to the edge of Marbury Wood yesterday morning, then today did the 3½ miles to just short of Orchard Marina. I’d rung on Friday to book an engine and gearbox service for tomorrow morning, and we’ve also arranged a Tesco delivery at the same time. I was surprised to learn that Mike Rimmer is no longer there, having moved back to Liverpool Boats. I’ll meet the new guy tomorrow morning. It’s been another lovely day, sunny with deep blue skies. 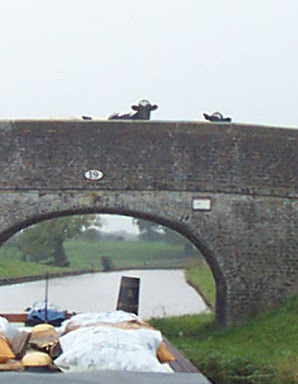 Since last post – Locks none, miles 5½. We wanted to catch the 10:30 entry “window” for Preston Brook Tunnel, so were on the move at 09:50. 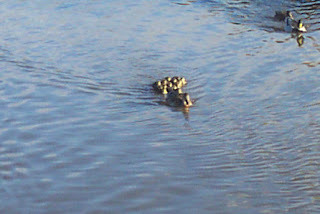 Saw this very young family of ducklings just down the canal. Could this be the last clutch of the year? 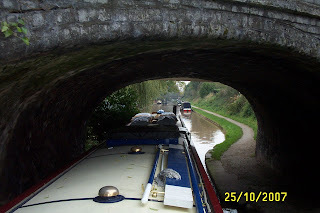 Followed another boat into the tunnel, and had to wait to go through the stop lock just the other side. Although only rising 4” it plays a role in safeguarding the water levels on the Trent and Mersey and Bridgewater. 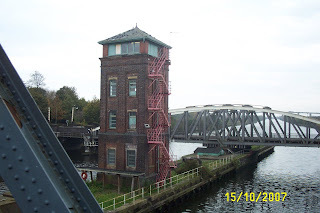 If the Bridgewater Canal were in the hands of BW instead of the Manchester Ship Canal Co. (Peel Holdings), it is possible that the levels could be equalised so the lock could be left open except in an emergency. As it is, it’s a bottleneck for boats leaving the tunnel. You can tell the season is almost over. 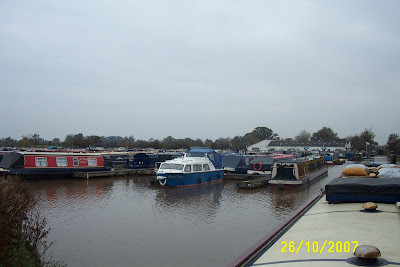 The Black Prince base at Acton Bridge was bursting at the seams with moored boats. 2¼ hours and a drop of rain later we were in Saltersford Tunnel, coming out into the rain again at 12:55. 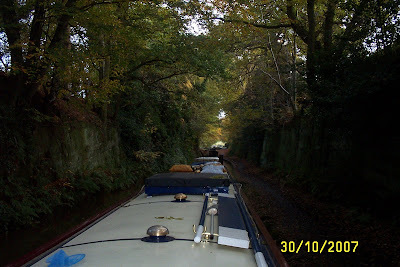 Meg was due a “comfort break”, so we pulled over in the basin just before Barnton Tunnel and had lunch as well. 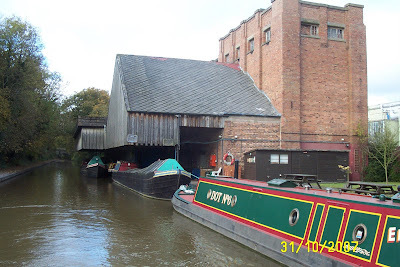 Followed another couple of boats through the last tunnel of the day, passed the Anderton Lift and dropped rubbish off at the Sanitary Station, and were moored at our favourite spot just on the edge of Marbury Woods by 15:00. Finally, when the traffic had eased, about 18:30, we turned the boat around. We prefer the left side to the bank if possible. PS Can't publish pictures tonight. I'll try again tomorrow. Update 18th Oct - Looks like they've fixed the problem. A grey start to the day, with threatening clouds from the start. While I was untying the boat I managed to miss the bank and finished up with my right leg wet to the knee. Not a good start to the day! 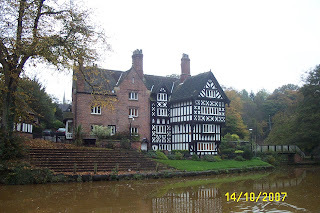 We finally moved off around 10:30, and had a steady run down to Lymm. Just pulled onto the visitor moorings as it started to rain. Only the towpath side moorings are available at the moment, the ones alongside the car park are being refurbished. Good job we’re out of the busy period! 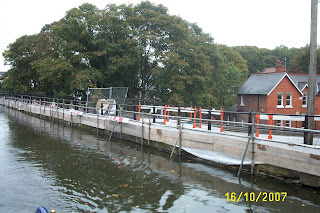 Smart new moorings in Lymm (eventually…..). Did a shop at Somerfield, then went back into the town for fish and chips for lunch. The rain showed no sign of stopping, and we didn’t want to stay overnight in Lymm, so we pushed off at around half-past one. The rain wasn’t too bad, anyway. Next stop was at Thorne Marine in Stockton Heath. They’re still there, although still under threat of closure by the leaseholder, Peel Holdings. They want to redevelop the site. More “des res’s”. 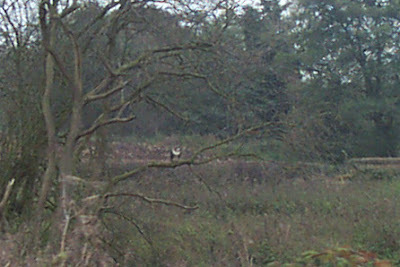 Near Grappenhall. 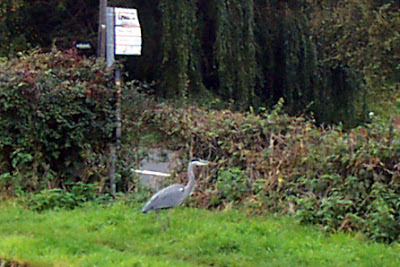 A heron waiting for the Number 57 to Stockton Heath. Topped off the diesel and water, picked up some more solid fuel and emptied the loo. This took some time as our arrival coincided with school finishing, and the boatyard shop is a favourite stop for sweets on the way home. By the time we got away it was gone half-past four. 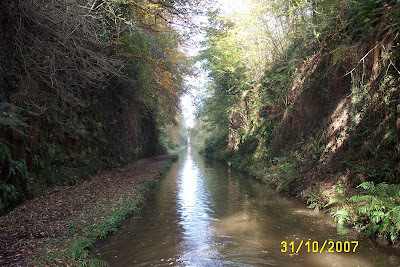 It took nearly 1½ to cover the last 4 miles to the spot we usually stop at, about 20 minutes from Preston Brook Tunnel. 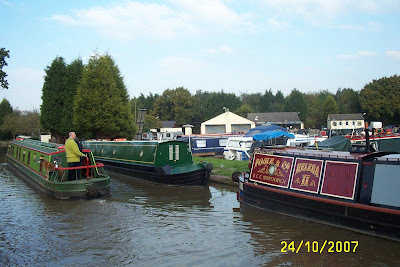 Not long before we stopped, we passed the charity boat from Claymore Boatyard at Preston Brook. It was tied to the bank, with a chap with his head in the engine bay. I gave him a shout, but he said he was OK, just some rubbish around the prop. We’d had the same problem all day. 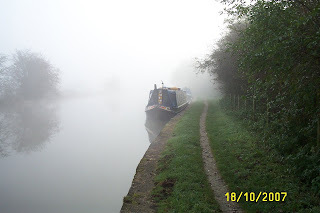 Anyway, after tying up I walked Meg back up the canal, and the boat was coming around the corner. Just as it approached, the engine died in a cloud of steam and diesel smoke. He tried to restart it with no success. I suggested that he leave it to cool down, but he decided to leave the boat where it was for the night and walk the 20 minutes back to the marina as it would soon be dark. We walked back to Seyella so he could use the phone to tell them what he was doing. I just hope it’s not completely seized. I guess the rubbish around the prop had caused the overheating. The boatyard will collect it in the morning. The rain stayed with us all afternoon, but it’s supposed to be fine the rest of the week. Had a quiet day yesterday. 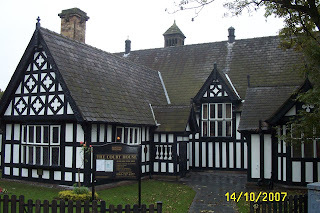 Took Meg for a long walk down into Worsley, and spent some time exploring the village. 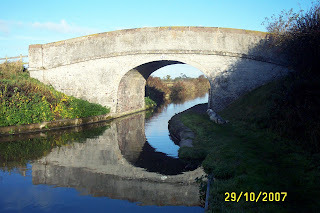 It’s not particularly old, but is known as the birthplace of the British canals. 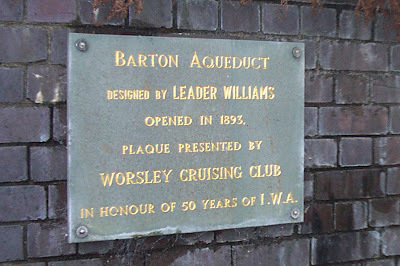 It was here, in 1759, that Francis Egerton, the 3rd Duke of Bridgewater, started construction of the first wholey artificial waterway in the country to link his coal mines around Worsley with his market in the rapidly expanding Manchester. 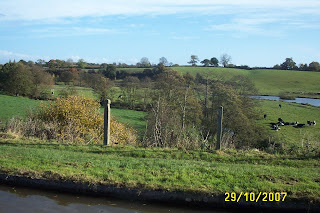 Later, the canal was extended to join the Trent and Mersey at Preston Brook, and finally the Leeds and Liverpool at Leigh. During the construction of the original line, he had cut about 46 miles of underground canal, to link the coal seams to Worsley Delph. 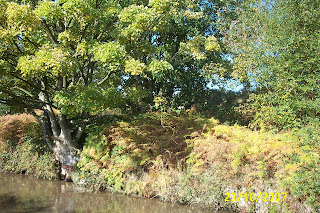 Worsley Delph, where the coal was brought to the surface. There are several interesting buildings in the village, like the Court House and the Packet House. We set off today at 10:40, and cruised for 10 minutes till we paused so I could retrieve a substantial pallet from the cut. 2 reasons – it saves anyone running over it, and I want one for the roof to carry bags of coal. From here to Waters Meeting was much as expected. Urban canal with the associated rubbish, anglers and disused factories and mills. 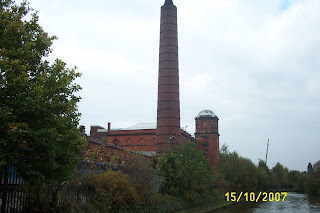 The grandly named Eccles Spinning and Manufacturing Co. Ltd. Still in use, but not it’s original function, I suspect. 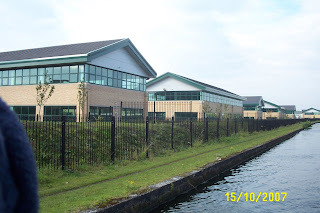 All of these new office buildings in Trafford Park are standing empty. 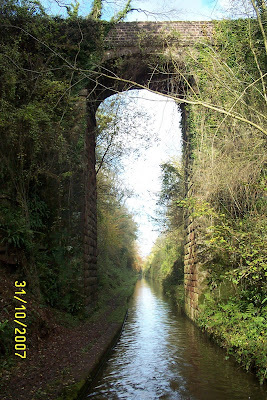 The highlight for me was passing over the Barton Swing Aqueduct. Mags kept telling me to watch where I was going, as I spent all my time taking photos! The aqueduct can be sealed at both ends and swung through 90° to allow large vessels to pass below on the Ship Canal. This, and the adjacent road bridge (pic 2), pivot on a central island. The moving section is 235 feet long and carries 800 tons of water. 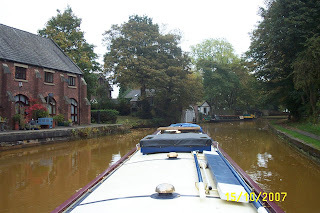 At Waters Meeting we were back on familiar water, and after a short stop at Sale Bridge for groceries, we pressed on through Stretford and Sale and out of the conurbation to Dunham Massey, where we moored for the night. 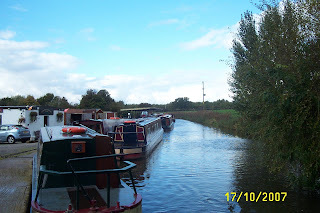 The forecast was for showery weather today, but, apart from a few drops soon after we moored, we got away with it.